Mayfran International, Cleveland, OH, introduces the CleanSweep-RM general-purpose chip conveyor, integrating proven coolant-cleaning technology with effective chip handling and removal. Its compact design will allow the conveyor to work alongside nearly any machine tool and coolant tank. Touted as a reduced-maintenance alternative to a basic hinge-belt conveyor, the CleanSweep-RM allows chips and coolant to enter the load area of the conveyor where large chips are carried by the hinge belt and elevated to the discharge hopper. 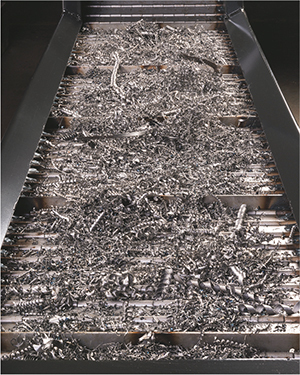 An internal chip-handling system removes small chips and fines while a removable screen box cleans the coolant.